It doesn't get much closer to the ocean than this! With new finishes, new bedroom furniture, "Westin Heavenly" mattress and box spring, 70" television and much, much more, you'll get the most comfortable, oceanfront stay at an affordable price. Our property is Owner operated and maintained, which offers a level of care that you won’t get with a management company. We care that each of our guests feels at home while visiting Maui. Kahana Reef is just steps away from the ocean, with amazing views of the ocean and the islands of Molokai and Lanai. Whether you lay in a chair on the grassy front lawn, sit at the lanai, walk to the sandy beach next door or take a dip in the pool, you can hear the peaceful sound of the ocean from everywhere on this property. It is a smaller complex with masonry construction, which adds to the peace and quiet of it all. It’s also centrally located between Kapalua and Kaanapali, for you to enjoy all that West Maui has to offer. It’s an amazing location for a relaxing getaway. This is a spacious top floor, 611sf, one bedroom, one bathroom unit. The kitchen is fully equipped and has granite countertops and newer appliances. The bedroom has a king-sized bed, and there is a queen-sized pull-out sofa bed in the living room. Kahana is centrally located minutes away from Kapalua, Napili, and Ka’anapali, where you can enjoy the best beaches, golf, and restaurants. There are also lots of restaurants within walking distance. Free wifi, cable TV, parking, phone, gas bbq grills. Laundry facility on-site. No air conditioning allowed in this complex, but it’s rarely needed with the great trade wind breeze. Minimum 4-night​ rental. There is a $150.00 cleaning fee. Daily maid service is an additional charge. 14.42% State Taxes added to all rates. **Take advantage of our discounted prices due to the seawall repair (estimated construction dates are May – September). Most guests are off at the beach, hiking or shopping during the day, so hopefully the construction will be of minimal impact on your stay. David and Brigette live in Kahana, Maui. They have been in the hospitality industry since 2013, and enjoy providing a welcoming experience to each of their guests. When they aren’t working to update rentals, they enjoy paddle boarding, family time on the beach, walking their dog, and gardening. Kahana Reef is just steps away from the ocean. We love the full ocean views, the peaceful sound of the ocean, the grassy front lawn, and the sandy beach just steps away. It is a smaller complex with masonry construction, which adds to the peace and quiet of it all. It’s also centrally located to all that West Maui has to offer. It’s an amazing location for a relaxing getaway. Our property is Owner operated and maintained, which offers a level of care that you won’t get with a management company. Kahana Reef is just steps away from the ocean, with amazing ocean views. Whether you lay in a chair on the grassy front lawn, sit at the lanai, walk to the sandy beach next door or take a dip in the pool, you can hear the peaceful sound of the ocean from everywhere on this property. It is a smaller complex with masonry construction, which adds to the peace and quiet of it all. It’s also centrally located to all that West Maui has to offer. It’s an amazing location for a relaxing getaway. Kahana is centrally located between the resort areas of Kapalua and Ka’anapali, so you won’t run out of things to do while visiting. If you want to be on the water, you can take a boat out to snorkel at Molokini, try out one of the surf schools, take a sunset dinner cruise, go whale watching (seasonal), or simply visit any of the beautiful Maui beaches. 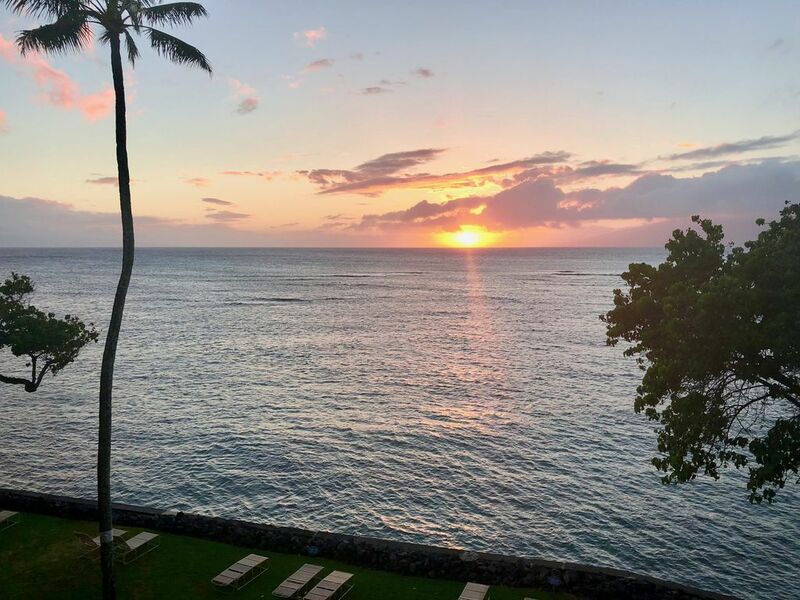 For the land lover, you can drive the road to enchanting Hana, watch the sunrise from Haleakala, go shopping in Historic Lahaina, go golfing in a tropical setting, or attend a luau. You can also take a helicopter and see the beauty of the island by air. We have stayed in many condos over the years and found this condo to be a very good choice. Kahana is extremely more quiet than the Kaanapali beach area but is just a short drive away. You can come back to your condo away from the crowds and sit on your lani and watch the set every night. The beach area by the condo again is yours to enjoy without the crowds of people. The bed was comfortable and condo clean. David and Bridgett where very accommodating getting us everything we needed. We will certainly come back to this condo if available the next time we visit Maui. Thank you for a lovely stay. Clean, beautiful condo. We had an issue with the lock, and David was down and fixed it within the hour. He was helpful and so nice. The condo is located in a good location in West Maui. Easy to get to and not crowded. The condo itself is is clean, bright with wonderful water views. Enjoyed the view very much. Didn't use the pool or any other accomadations of the facility. This is a great place to base your northwest Maui coastline vacation. The views are spectacular and the property is convenient to Lahaina. The owner was great to work with—friendly and responsive. Our unit is a one bedroom, one bath condo. There was plenty of room and it has nice furniture and decor. We highly recommend this property. We loved our stay in this lovely, well-maintained, and tastefully furnished Condo. All appliances and conveniences were very good, and A+ on comfy king bed and walk-in shower. Furnished lanai off the living room faces the ocean, and on the property, a pool, lounging chairs, and BBQ grill are oceanside, and available to the Kahana Reef guests. We enjoyed the Chinese restaurant a few steps across the street. WiFi excellent and easy to connect. The balcony and the beach access - so lovely! Condo was very clean and the ability to use the beach chairs and snorkel supplies were great!